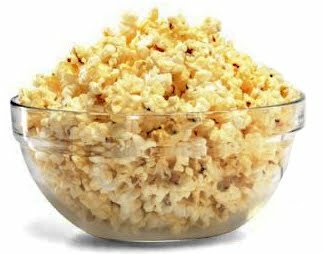 Nancy's Nook : Happy National Popcorn Day! I saw Tayla's status on FB this morning (Hi, Tayla)... and I KNEW what today's topic would be! I grew up on popcorn on Sunday nights. (It makes a delicious supper... and GREAT MEMORIES.) We'd go to church (Training Union at 6, then the worship service at 7), then we'd come home and pop the corn ... and drink some pop... and watch TV. When BONANZA started up, we'd often go to the Morrises after church and watch it in color (often with popcorn).... It was the first TV show we ever saw in color. As I recall it was mainly in green and purple. So this is how my blog goes. I start writing about one thing (popcorn), then it evolves into another thing (BONANZA). That directs you into my next poll. Please take it. Thanks so much. Popcorn...YUM! I am remembering Gunsmoke, getting pincurls for church the next day and pop popping popcorn. Sometimes I feel like I'm living in the days of Gunsmoke, but I'd prefer Andy Griffin's country living....where law and order seemed easier. Love your blogs! They are so refreshing and well...good tasting. OMG, we went to our neighbors to watch Bonanza in color too! How funny. We brought the popcron. Dad would pop several big pans of it until it filled up the big turkey roasting pan, and we'd carry that over to the neighbors on Sunday night to watch The Wonderful world of Disney followed by Bonanza. Great memories I hadn't thought of for a long while. Thanks! What a fun poll, too. Audrey and Beth, those are GREAT comments... THANKS!!!!! I had a wonderful party! !